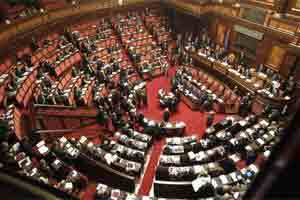 Rome/Athens: Italy’s parliament is rushing through austerity measures demanded by the European Union to avert a euro zone meltdown, after US President Barack Obama ratcheted up pressure for more dramatic action from the currency bloc. Obama spoke with German Chancellor Angela Merkel and French President Nicolas Sarkozy late on Thursday and also called Italian President Giorgio Napolitano, who in turn was due to speak to Sarkozy in a round of telephone diplomacy. A German government official said there had been an “exchange of opinions" between Merkel and Obama, while treasury secretary Timothy Geithner demanded fast action from Europe. “The crisis in Europe remains the central challenge to global growth. It is crucial that Europe move quickly to put in place a strong plan to restore financial stability," Geithner said in a statement following a meeting with finance ministers from the Asia Pacific Economic Cooperation countries. After months of dither and delay, Rome appears to have got the message as bond markets pushed it to the brink of needing a bailout that the euro zone cannot afford to give. If the votes pass smoothly, Napolitano will accept Berlusconi’s resignation over the weekend and ask veteran former European commissioner Mario Monti to form a government. Fellow technocrat and ex-European Central Bank (ECB) policymaker Lucas Papademos will head a new unity government in Greece. Berlusconi, who lost his majority in a vote on Tuesday, has promised to resign after the financial stability law is passed by both houses of parliament. He had insisted on early elections but then softened his stance. Markets were calmed by the prospect that there would be an interim government, rather than a three-month vacuum before elections are held. “The most important element to overcome this crisis is a very trusted and able new Italian government that can really fulfill the structural changes that are needed," ECB policymaker Ewald Nowotny told Reuters in Beijing. The euro firmed but investors doubted whether it would climb far, given that even a technocrat Italian government might struggle to make progress on long-promised, never-delivered fiscal reforms. Italian 10-year borrowing costs fell sharply to 6.7%, having hit an unsustainable 7.5% earlier in the week. “We can have maybe two or three days of calm -- in inverted commas -- but nothing has really changed underneath," one bond trader said. Spain, the euro zone’s fourth largest economy, which holds elections in nine days’ time, stopped growing in the third quarter, raising doubts about its ability to meet deficit reduction targets. With European leaders dithering over how to tackle the deepening crisis, pressure has mounted on the European Central Bank to act more forcefully by becoming a full lender of last resort, as the Federal Reserve and Bank of England are. Three senior ECB policymakers on Thursday rebuffed arm-twisting from investors and world leaders to intervene massively on bond markets to shield Italy and Spain from financial contagion. Germany economy minister Philipp Roesler said on Friday the ECB did not have “unlimited firepower", adding that if it opened its floodgates fully, they could never be closed again. Germany strongly opposes the ECB taking on a broader crisis-fighting role, arguing this would compromise the independence of the bank. The euro zone’s plan for a more powerful rescue fund may also be running into trouble. Klaus Regling, the head of the €440 billion European Financial Stability Facility (EFSF), was reported by the Financial Times as saying the recent market turmoil had made it more difficult to scale it up to €1 trillion, as proposed by euro zone leaders who promise a definitive plan by December. Luring investors by offering insurance on losses, the centrepiece of a plan agreed in Brussels on 26 October, would now probably use up more of the fund’s resources, Regling said. “The political turmoil that we saw in the last 10 days probably reduces the potential for leverage. It was always ambitious to have that number, but I’m not ruling it out," the FT quoted him as saying. “It is very important that these plans -- actually these decisions -- now really get operational, and I’m a bit concerned that this takes a long time, perhaps too long," he said. In Athens, Greece’s prime minister-designate was set to name a new crisis cabinet to calm the political turmoil that has threatened to bankrupt Athens and force it out of the euro zone. Greece’s two main parties agreed on Thursday to make Papademos head of a new unity government, ending a chaotic search for a leader to save the country from default. He must now fulfill the terms of a €130 billion bailout plan agreed with European partners in October. The former ECB vice president faces huge challenges after a chaotic power struggle between Greece’s two main political forces. Sources in the ruling Socialists and opposition New Democracy said Evangelos Venizelos was likely to remain finance minister when the new cabinet is sworn in at a ceremony scheduled for 07:30 pm. Automotive giant Daimler spoke out against keeping Greece in the euro zone at all costs and said the euro would survive even if it were forced out. “I wouldn’t consider one link splitting off from the rest as a ‘break-up´ of the euro zone," chief executive Dieter Zetsche told Reuters in an interview.